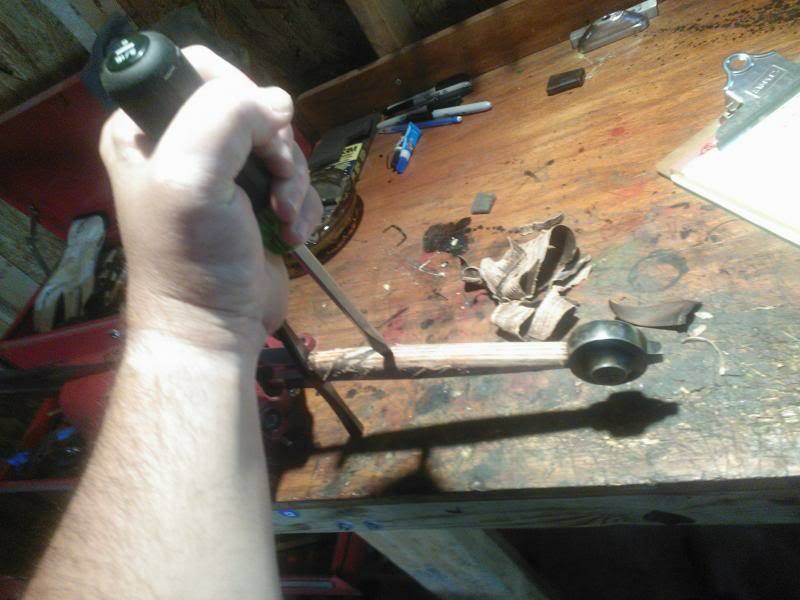 Forum Index > Makers and Manufacturers Talk > Did you just intentionally destroy that Albion Baron's grip? 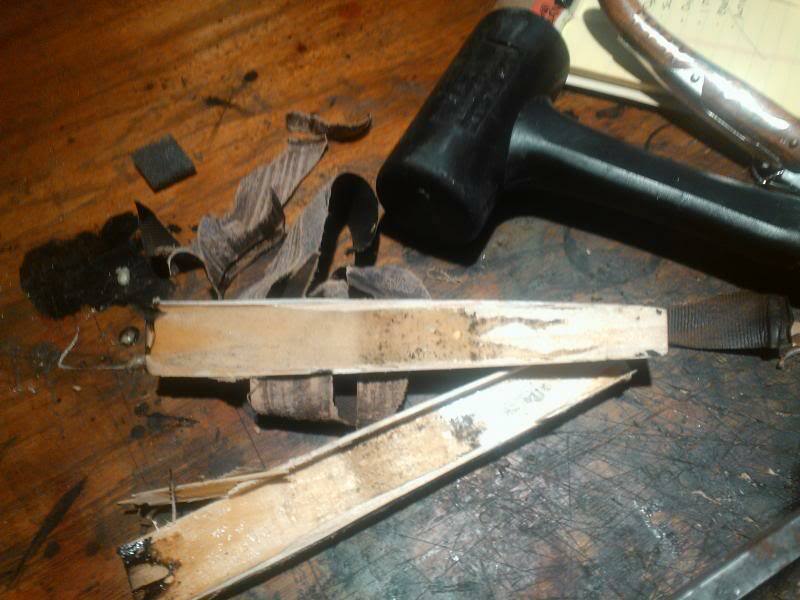 Posted: Thu 23 May, 2013 9:21 pm Post subject: Did you just intentionally destroy that Albion Baron's grip? The following images my disturb some viewers. Parental guidence is advised. I have recently had several customers wanting larger diameter grips for their Albions. These customers have stated that they have larger hand sizes which require a beefier grip to use their sword comfortably. Even though I have explained to these customers that this would affect the lifetime warranty, I have still been requested to undertake these operations. I have done a number of these, and as such, I thought I would detail this process a little for any interested. So, in answer to the post's original question; Yes. Yes I did intentionally destroy the grip on an Albion Baron. This victim was identified as an Albion Baron. 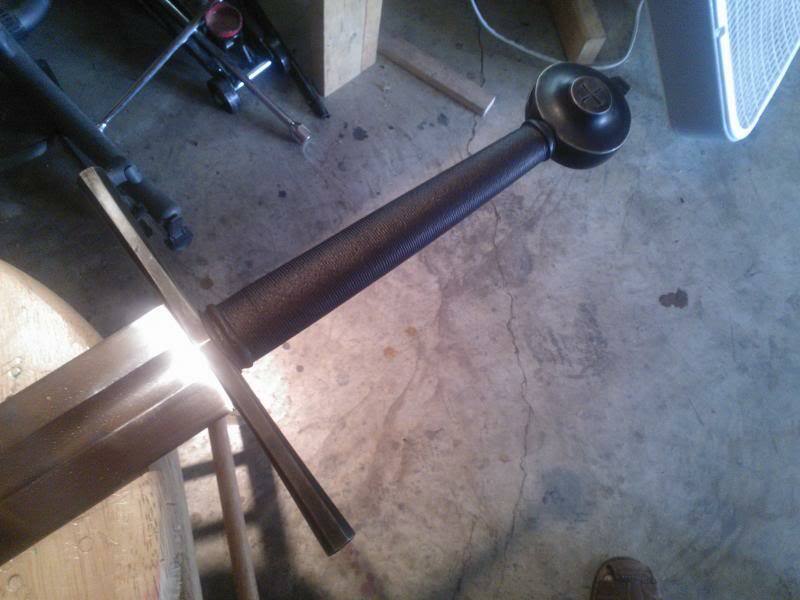 The old grip would have to be completely destroyed. The grip leather is well-bonded to the wood and comes off with moderate difficulty. I've never had a problem with grip leather lasting on an Albion, and it's easy to see why. The leather is really well-adhered to the wood with epoxy. I got most of it off. Normally, I would get it all off, but since this is the destruction of a grip - not worried about this level of stripping. 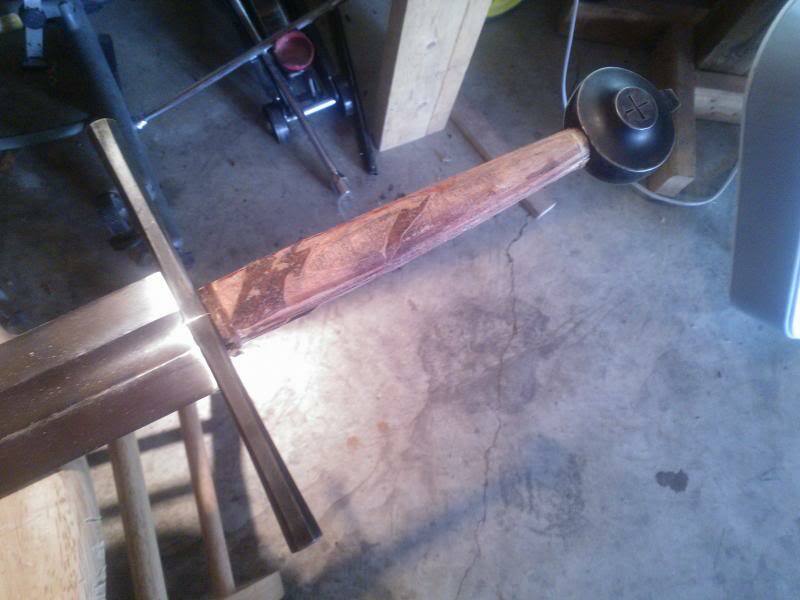 The leather and hemp riser remnants laid to rest on my work bench. A few taps at the seam with a chisel-tipped screwdriver gets the split started. There we go. Once started, the scales split right off quite easily. The bare tang. Albions have just about the largest tang I have ever seen on a production sword. Also, the wedge peened fittings are solid as a rock with the scales removed, just as they should be. Like this, this Baron still rings like a bell. 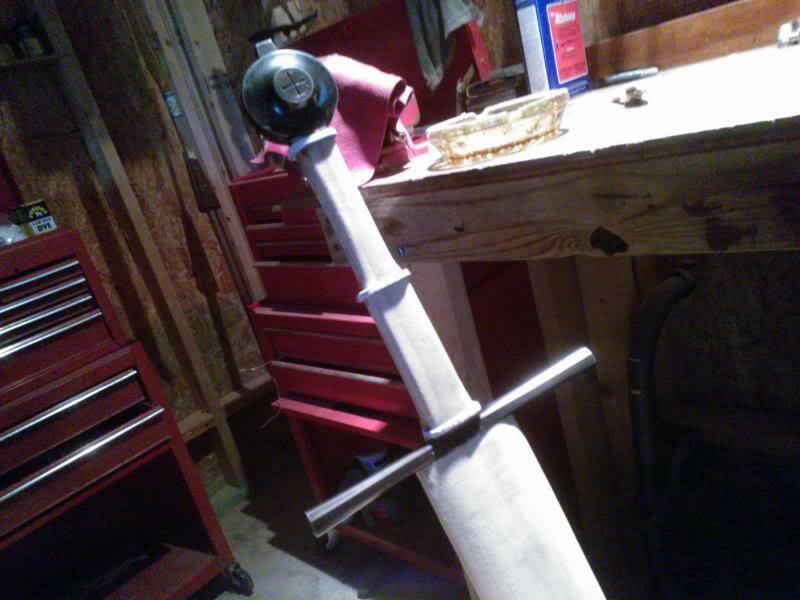 When many other swords are at this stage, the guard is free to slide back and forth on the tang with nothing retaining it. With the grip off, it was time to give the hilt bluing a revamp, as it had worn off over time and the customer wanted the finish dark again. This was done with a cold bluing agent after the stock bluing had been entirely stipped off. A lengthy, but aesthetically rewarding process. New scales in place, finished to final form, with risers fitted. The sandwich scales were attached using rectangular slabs with slots hand fitted for the tang. 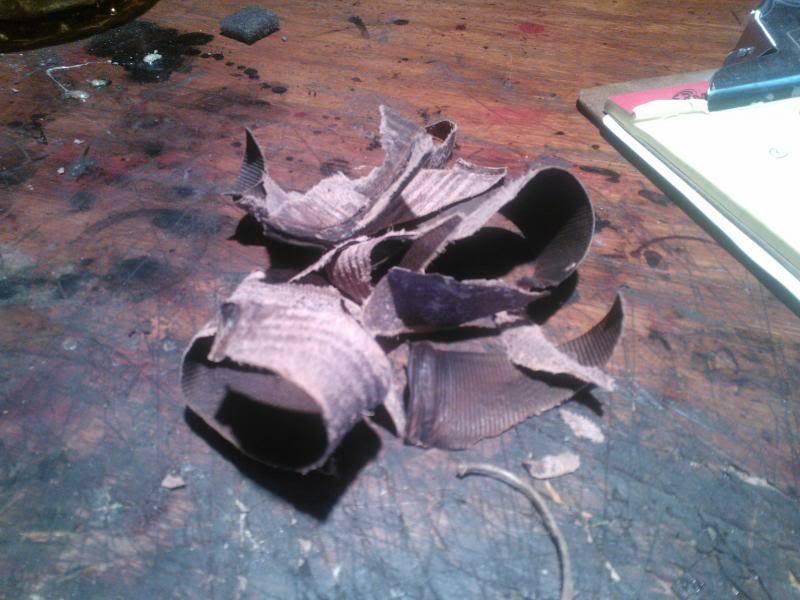 These were attached with epoxy, clamped, and allowed to cure. 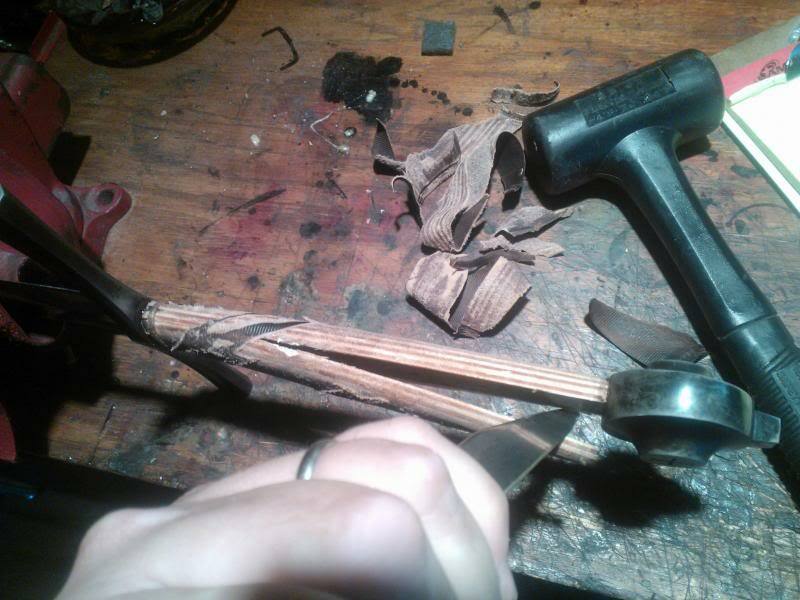 I then completely hand-rasped the handle to rough shape. After this, about 3 hours of hand-sanding were needed to get the final form. The form is a bit thicker with a rounded rectangular profile, while still thin enough to not be overbearing in appearance. Later on, the customer changed the riser format, but I did not take a photo before I covered it. The new wine-bottle type grip completely finished off with a classic antique red cord-bound leather wrap. 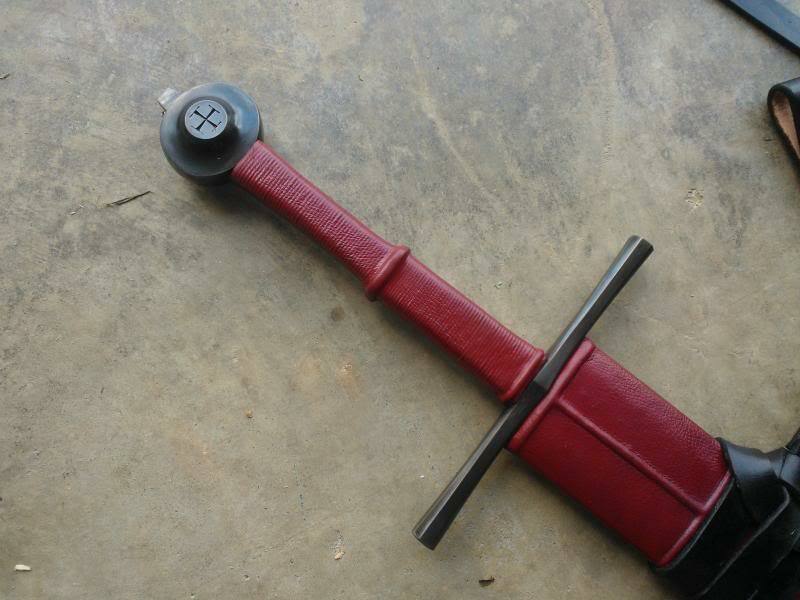 The grip was inspired by XIIIa.7 as detailed in Records of the Medieval Sword. Though it is a little bit longer than the historical inspiration, it still accents the Baron quite nicely. Both the customer and myself are quite happy with the end result. The new grip looks great. Might have to send you mine. A nice look under the hood. 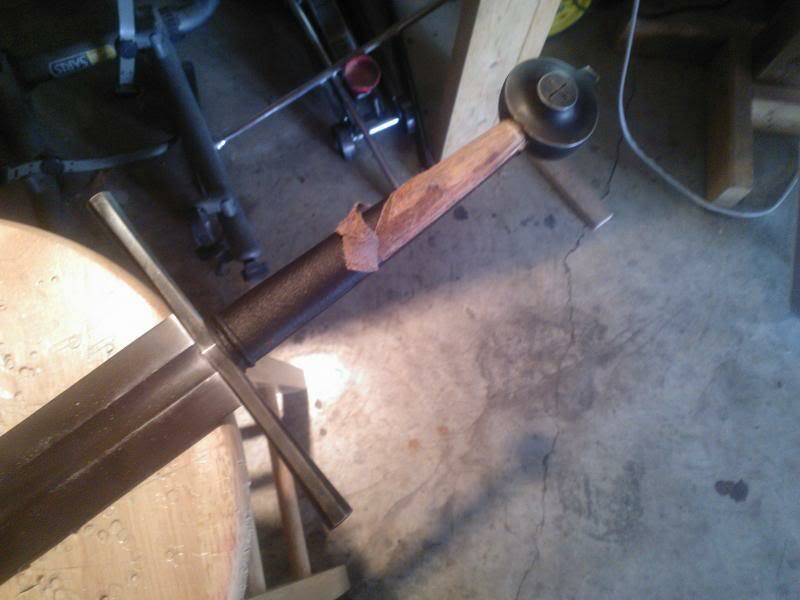 So did you string wrap the core of that handle you made or did you do it the Albion way of leather on bare wood? Albion's way makes for nicer looking handles with crisper lines but I like the extra strength a string counter wrap offers. I'm not saying their grips are weak or anything it is simply a matter of trading off one feature for another and my tastes go in another direction. anyway, thanks for the look and good work. My problem with my Baron isn't the width of the grip though, it's the length. Not much solution for that. Beautiful job. Watching that destruction at first was painful but the result made up for it. You know, I've also liked the Duke's blade but have never been a huge fan of the straight, plain grip, that's more or less what I would want on it as well. Have you handled the Albion Steward? It's also a war sword of the same category but a shorter grip and it handles like a dream. It's also very good 1 handed in my opinion, a true hand and a half sword. It's a brutal cutter, it cuts bigger than it is. 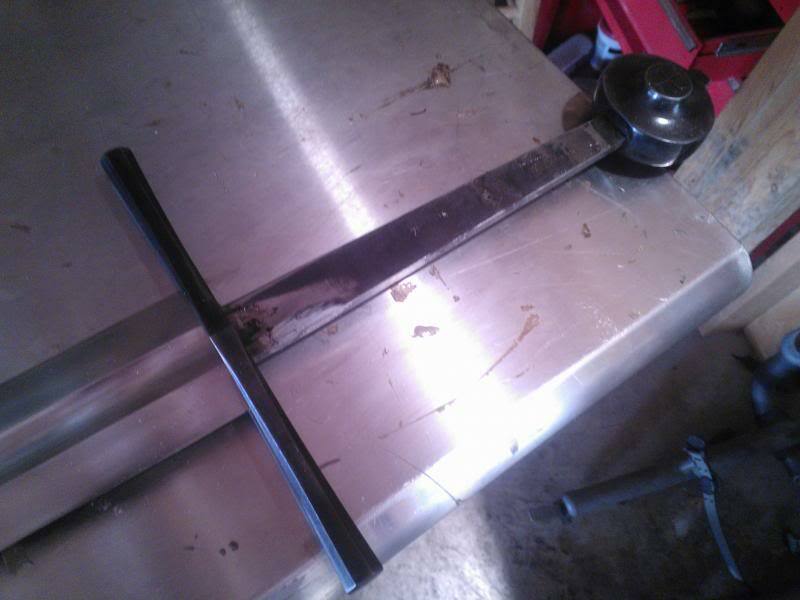 A solution might be grinding the shoulders of the blade to increase tang length. However, the owner of this rework has always seemed to be "ok" with the grip length of the Baron. He has modified a number of swords on his own and I am assuming it was more a matter of scabbard and grip work he chose to send out. I am looking forward to seeing this one in its new dress and may cut in for a a dance or two. We have gone back and forth a couple of times between a similar ATrim and this Baron. 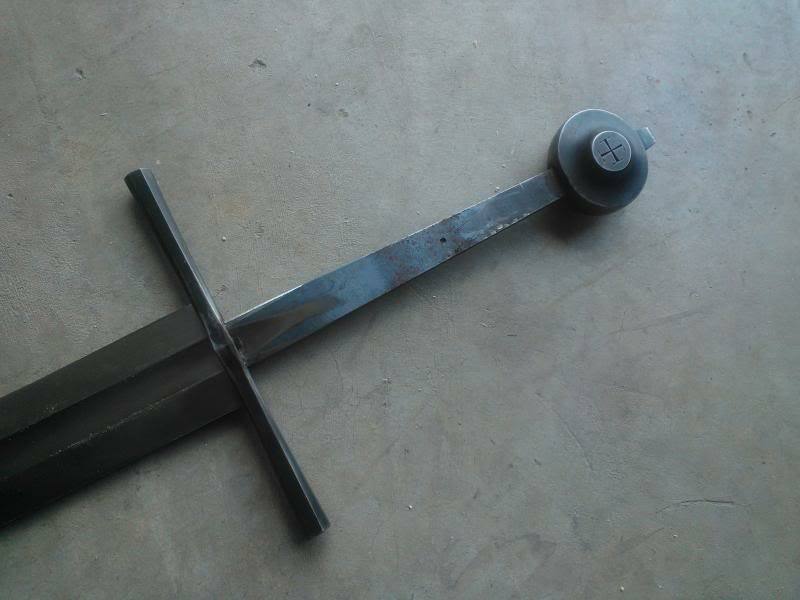 The ATrim with an eight inch grip but a lighter sword overall. The Albion heavier and more nose heavy. The speed and weight kind of balance out the two as quite similar in cutting. The owner has always seemed to prefer his Baron's presence over the ATrim's longer lever and my perception of the agility differences. I'll maybe chide him about color choice but was recently reminding him of a tomato soup and pastel blue hell that is kind of growing on me.